Nicole came to Calgary from the US after receiving a bachelor's degree in geology from Amherst College, a small liberal arts school in Massachusetts. While at Amherst, Nicole worked as both a field and research assistant. 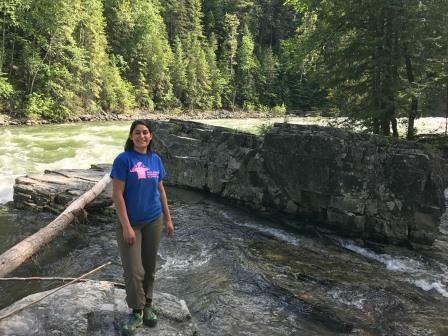 Her studies culminated in an honors thesis, which focused on the tectonic significance of metabasites from the Highland Mountains in southwestern Montana. Nicole is currently working on her master's thesis at the University of Calgary under the supervision of Dr. David Pattison. The Purcell Anticlinorium is a regional scale, NW-trending anticlinal structure in the eastern portion of the Omineca belt in southeastern British Columbia. It is a Mesozoic structural culmination that contains some of the oldest rock exposures in in the Cordillera, as well as some of British Columbia’s most prolific mineral deposits. The aim of this project is to examine the nature of the interface between two major geological domains, the Purcell Anticlinorium to the east and the Kootenay Arc to the west. This region of complex geology derives from ~1.4 billion years of tectonic activity, including two major phases of intracratonic rifting, terrane accretion and orogenesis, and orogenic extension and uplift. This project seeks to examine the tectonic evolution of the region through constraining its structural, magmatic, metamorphic, and thermochronological history. Unraveling the nature of this poorly understood tectonic interface will inform mineral exploration within the region.